This week for Marker Geek Monday over on the Stamping Bella blog I indulged in a favourite technique I haven’t done for quite some time. I thought I would share the results here too. This entry was posted in Cards, Colouring, Tutorials & Videos and tagged No Line Colouring, No Lines, Stamping Bella on June 5, 2017 by Elaine. Tilda with Big Tulips & A Giveaway! I have an extra, brand new, Tilda with Big Tulips stamp, which I’d like to giveaway as a little thank you to my readers. All you have to do to enter the giveaway draw is comment on this blog post (no other requirements, and you do not need to have a blog to enter). I will draw a winner on Friday 1st February 2013, so get your comments in before 9am GMT that day. I stamped the image with Adirondack Lake Mist (I stamped it lightly first on scrap paper so that the stamped image came out really light) on Make it Colour Blending Card and coloured with ShinHan Touch Twin Markers (details below). Last year I posted a video on No Line Colouring, along with a step by step tutorial over on Splitcoast Stampers. The main difference here is that I coloured the background first for a bolder look (similar to my Whimsy Stamps Santa and Teddy Portrait card and also my Lollyrot card). The designer paper is from an old My Mind’s Eye 12×12 collection (check me out getting the paper stash used up) and I inked the edges with Distress Ink in Walnut Stain. The edges of the diecut image layer were inked using a Versamagic Chalk Ink in a blue to match the background colouring, just to finish off the edges nicely. The chipboard embellishments are Make it Crafty Butterfly Leaves, and I coloured them with ShinHan Touch Twin Markers in some of the same greens I used on the image. Thank you for dropping by and checking out my card! I always love to hear from you, so don’t hesitate to leave a comment. I do try to answer any questions, so if you have any don’t be afraid to ask! This entry was posted in Cards and tagged Cute, Magnolia Stamps, Make it Colour Blending Card, Markers, No Line Colouring, No Lines, Shinhan, Tilda, Touch Twin on January 26, 2013 by Elaine. “No Lines” – a Tutorial and Video! Has it really been ten days since my last post? It REALLY doesn’t seem like it has been that long. I swear the universe is playing tricks on me. We’ve been enjoying some gorgeous sunshine here in the UK, or rather, the dog has been enjoying it while I’ve been slaving away indoors. Alright for some! Today I can finally share something I have been working on this month. 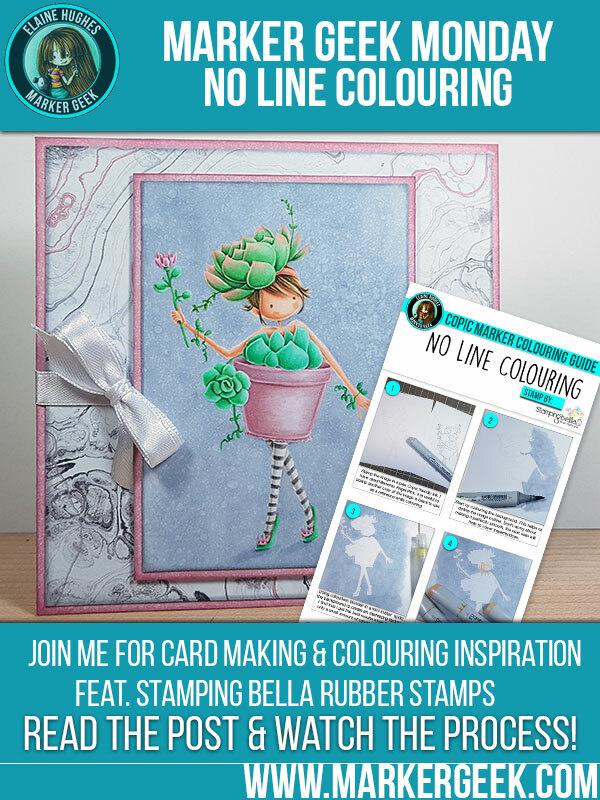 The lovely (and very talented) Beate asked me to create a guest tutorial for Splitcoast Stampers on “No Line Colouring” and it is live on the SCS website today! If you receive the weekly SCS newsletter you should see it in there, or you can click >HERE< to go directly to it on the website! In late 2011, my wonderful friend Zoe McGrath of Make it Crafty caused a stir among stampers with her idea to colour an image with “no lines”. This technique involves stamping an image using a light coloured ink rather than the usual black, brown or dark grey. As you colour your image, the lines start to disappear, which results in a beautiful effect. A little more care is required in building up the shading of your image and developing the shadow areas, as you will have no stamped outline to rely on for definition. On one hand this can be taxing and requires some patience, but it can also allow you more freedom in colouring, particularly when defining hair or other features. Without building definition using shading, images will look flat. NOTE: In my tutorial, alcohol based markers (ShinHan Touch Twin) have been used, but the technique would be similar for other mediums such as coloured pencil and of course for other brands of alcohol based marker. It seemed fitting to use one of the gorgeous Make it Crafty rubber stamps for the tutorial. I chose “Sweet Angel” and as with all the Make it Crafty rubber stamps, she is available direct from Make it Crafty in Australia and also in the UK/Europe from me at Quixotic Paperie. For those of you in the US Make it Crafty stamps are also available from my other wonderful friend Susana at Susana’s Custom Art and Card Design. Colouring was done with ShinHan Touch Twin Markers, and as you may know, Susana has these in stock in handy combo sets put together by me at Susana’s Custom Art & Card Design. I stamped the image in Memento Angel Pink on my favourite paper – Make it Colour Blending Card. Along with the tutorial I also created a little video (and I won’t go into the technical nightmares I had, suffice to say there were tantrums – I REALLY need to sort out my video camera set up! ), which features a brand new stamp from my friend Susana’s new Susana Loves Stamps line! When I saw this release I fell head over heels – absolutely love them and can’t wait to show you the rest. Markers used in the video are from the ShinHan Touch Twin Brush Marker combo sets available from Susana’s Custom Art & Card Design. You get a free peek in the video as the new stamps won’t be available until Friday! On Friday 30th March 2012 you will find them here in the UK at Quixotic Paperie along with many other stamps from SCACD, and you will of course find them direct at Susana’s Custom Art & Card Design in the US! More on the release on Friday when you can join us for the hop! That’s it, thanks for dropping by! Hope you enjoy the tutorial and video, I’d love to hear from you if you do. This entry was posted in Cards, Tutorials & Videos and tagged Colouring, Cute, Make it Colour Blending Card, Make it Crafty, No Line Colouring, No Lines, Shinhan, Touch Twin, Touch Twin Markers on March 28, 2012 by Elaine.